Ylvis is a variety show group from Bergen, Norway, consisting of the two brothers Bård Ylvisåker (born 1982) and Vegard Ylvisåker (born 1979). The brothers originated from Sogn, but grew up in Bergen and Africa. 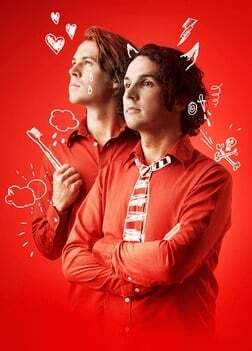 The brothers debuted professionally on 19 October 2000 at the Ole Bull Theater in Bergen with the show "Ylvis – en kabaret" ("Ylvis – a cabaret"). In connection with the show was the song "Rumor says" recorded, pressed as a CD-single, and sold during the show, but was never put out for regular sales. .